Western Nebraska boasts of two thriving communities that share the banks of the North Platte River: Gering on the south bank, Scottsbluff, on the north. Known as "the Panhandle's Twin Cities," Gering is the older of the two and maintains the county's records as the county seat of Scotts Bluff County. A town was founded in March 1887 when this area was still part of Cheyenne County. Shortly thereafter they chose the name "Gering" for Martin Gering, the city's first banker. The new town's biggest promoter, Oscar Gardner, was named the first postmaster. Its location was chosen based on the survey by the Union Pacific Railroad. However, tracks were not laid along the south side of the North Platte River until 1910, which was cause for great concern -- since a railroad was the lifeblood of a town in those days. The primary objective of this new town was to help organize a new county, and be the county seat. Plans for organizing Scotts Bluff County went well, but there were three towns hoping to be named as its seat of government. After several elections, the balloting was between Gering and Mitchell. Support swung to Gering when voters were promised that, if Gering was chosen, the land company would build a free bridge at that location across the North Platte river. This promise was kept and Gering had the first bridge between old Camp Clarke (near Bridgeport) and the government bridge at Fort Laramie. Now there are three bridges across the river in the Gering/Scottsbluff area. Irrigation arrived in the area in 1902. The water is brought in by laterals from dams along the North Platte River in Wyoming, many miles to the west. Irrigation was the most important factor in the development of this new country, making the land in the valley profitable for farming and livestock feeding. Over the years, primary crops have been sugar beets, corn, dry edible beans, and alfalfa hay. The complex irrigation system, devised almost 90 years ago and considered to be "near-genius" in design, is also being used on several vegetable crops being introduced. The rich culture and history of Gering are showcased in the North Platte Valley Museum, the Farm and Ranch Museum, Wyo-Braska Natural History Museum, and the museum at Scotts Bluff National Monument. The Valley's largest draw is an attraction that we had nothing to do with - our ancestors made it. The Oregon, California, and Mormon Trails attract history buffs, motor coaches, school groups and families from all over the world. Scotts Bluff National Monument and nearby Lake Minatare annually attract close to 300,000 visitors to the area. 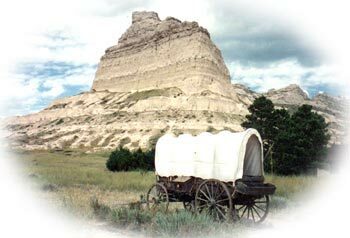 In honor of our heritage, Gering is proud to be the home of the oldest celebration in the state of Nebraska, "Oregon Trail Days." This four-day, action-packed event is held in July every year. The Five Rocks Amphitheater and pavilion houses bands and other open-air entertainment in the summer months, as well as Thursday night movies with a "drive-in"-like atmosphere. Tickets for Five Rocks Events are available at the City of Gering offices, 1025 "P" Street. The City of Gering boasts a fantastic 18-hole course golf course with Bent Grass fairways and Bluegrass greens. The golf course also has a driving range, a clubhouse, and additional cart storage. When you walked into the Wyobraska Natural History Museum, also known as Wildlife World, you could not help but utter an unexpected "Wow!"